It’s that time of year again … open enrollment for insurance plans! I know this sounds awful but stay with me here for a minute and I might help you save some money. What does this mean for you? And how can you maximize your benefits for the amount of money you are investing in your insurance? Do you really need dental insurance? And don’t forget to schedule an appointment to see us before the end of the year! Do your math. See exactly how much dental insurance is going to cost you for the year. You might look at the amount per paycheck and think it’s only going to cost me X dollars a paycheck. But when you multiply that out by 26 pay periods a year, the total amount can be surprising. You can always call to see what the fees are for your standard visits. If you take great care of yourself and your kids’ teeth and only expect preventative treatment like exams, cleanings, x-rays, fluoride, and sealants, it doesn’t always make financial sense to pay for dental insurance as you may find that you are contributing more than you are getting in benefits. 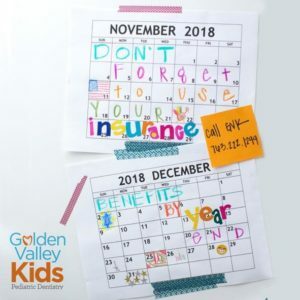 Golden Valley Kids also offers a savings plan (Cavity Free Club) for those families without dental insurance. More information on the Cavity Free Club can be found on our website goldenvalleykids.com under the finances tab. Membership in this program reduces fees for preventive and restorative procedures, but not orthodontic procedures. Braces. If you or your child will be starting orthodontic treatment in this next year, dental insurance usually makes sense. Dr. Borodkin always tries to let parents know when they can expect to start ortho treatment so you can plan ahead of time and save up for this cost. Keep in mind that dental insurances will only participate in orthodontic treatment once per lifetime. This means that if you or your child needs more than one phase of treatment, or retreatment, dental insurance will not help pick up the tab. Benefits for this calendar year will generally expire on Dec. 31st. So, if you’re due for an exam and cleaning, don’t forget to schedule with us and come in. If you’ve been delaying dental treatment, schedule to get it taken care of before the end of the year. Keep in mind, most insurances won’t “cover” an exam and cleaning unless it is six months AND one day from your last cleaning. Some patients find that if they delay or defer their exams and cleanings, that their insurance will only end up paying for one visit in that calendar year. For more specific information about your dental insurance plan, such as frequency of visits and coverage of fluoride treatments, it’s best to call the company or refer to your benefits packet.